Place the corned beef in a stock pot, cover with water by 3 inches and bring to a rapid simmer. Cook for 10 to 12 minutes, then skim off any foam that has formed on the top and discard. Reduce the heat to medium-low, add the peppercorns, cloves and bay leaf. Cover and continue cooking until the corned beef is fork-tender, 2-1/2 to 3 hours. Transfer the corned beef to a cutting board and cover loosely with foil to keep warm. Add the potatoes to the stockpot and increase the heat to medium-high. Cover and cook for 5 minutes, then add the carrots, turnip and pearl onions. Simmer for an additional 10 minutes, then add the cabbage wedges and continue cooking until the potatoes and vegetables are tender when pierced with a knife, 10 to 15 minutes longer. While the vegetables cook, prepare the horseradish cream sauce and slice the corned beef. Combine the sour cream and horseradish in a small bowl. Season to taste with salt and pepper and transfer to a serving bowl. Slice the corned beef across the grain into 1/4-inch thick slices. Once the vegetables are cooked, use a slotted spoon to transfer them to a large serving platter. 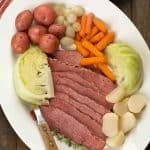 Return the sliced corned beef to the pot for 2 minutes to reheat, then arrange on the serving platter with the vegetables. Serve with horseradish cream and coarse grain mustard for dipping.